In 1997 The Austin Voice newspaper and Chicago Civic Media initiated the Shutdown Project, as we called it, with Chicago's 15th District police then led by District Commander John Richardson and subsequently by DC Lorenzo Davis. This was a media-driven partnership of citizens and police. We called it Media-driven CAPS: media-driven community policing. The Shutdown strategy was simple: it was for police to take and hold public drug dealing areas with citizen support coordinated in community (The Austin VOICE) and citywide media (WVON radio). Two major community events organized by the THE AUSTIN VOICE, with each attracting well over 100 members of the community helped to organize the community. For a time, this the Shutdown project succeeded beyond all expectations, with successes in 15th District leading to versions of it being implemented in two neighboring policing districts: the 25th District north of Austin and the 11th District east of Austin. In 1999, we submitted this ten-page Shutdown Project Proposal to the Chicago Police Department. The proposal argued for the feasibility of citywide implementation of the West Side Drug Area Shutdown Project. There was no response. 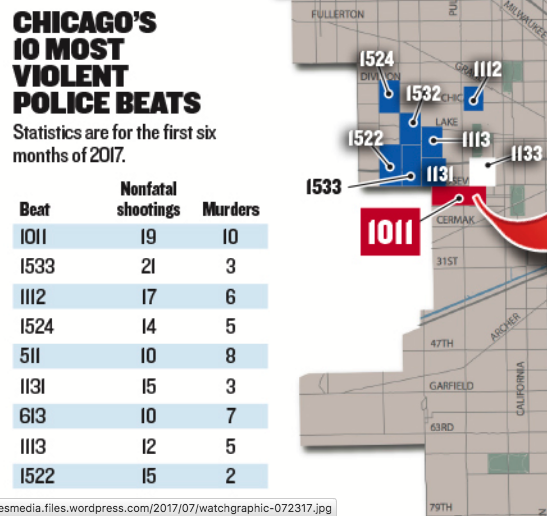 The CPD turned a deaf ear to the recommendations the Commanders of the 11th, 15th and 25th police districts. The Shutdown Project was created and sustained pro bono over a two-year period with the hope that its success would generate funds needed to sustain it. Sad to say, however, efforts to reach out to funders and City Hall, however, met with no response. Oct 18 Letter from two Austin ministers inviting Austin residents to Operation Salvation's "Strategies and Solutions Conference" held at San Miguel School in Austin. Official 25th (Grand Crossing) District list of 11 street dealing areas confirmed with 25 District Police April 2000. May 18 25th District Letter to Austin Voice Editor Brad Cummings with update on six drug hot spots in the district. Jan 20 Chicago Defender story "Austin group launches citywide anti-drug campaign" by Chinta Strausberg. Jan 19 Letter of commendation from Governor George Ryan to Shutdown Project organizers. Jan 19 Agendafor January 19 Shutdown Project Kickoff Banquet at Austin branch of the Harris Bank with keynote address by WVON radio personality Cliff Kelley. This event attracted over 100 participants including Austin's political, law enforcement and education leaders. Jan 11 Letter asking Austin residents to participate in the Shutdown Project from Commanders of the 15th and 25th Police Districts and Deputy CPD Chief Thomas Byrne. Oct 12 "VOICE Launching Drug Area Shut-Down Partnership"
cover story in AUSTIN VOICE, with "Rat Patrol" coupon application, introducing phase II of Shutdown Project. Sep 20 Ten-page Shutdown Project Proposal to Chicago Police Department by Chicago Civic Media. Document proposes citywide implementation of the media-driven West Side Drug Area Shutdown Project. Gives history of the West Side project. Spells out the methodology of media-driven community policing. Sep 9 Linkage Letter from AV to CCM illustrate the type of agreement media can make with each other and cooperating organizations. Dec 12 Sun-Times Dennis Byrne writes about the Shutdown Project in "Taking back the streets in Austin". Nov 25 for AUSTIN VOICE wrote "Thanksgiving Deadline Met for ClosingDown Top 10 Austin Dope Sites". Nov 11 Wrote AUSTIN VOICE cover story "Austin's Top10 Dope Dealing Shutdown Targets" featuring photos and a large graphic with street addresses and beat locations of 71 Austin drug areas. Oct Flyer for October 8 Austin Youth Advisory Council meeting at Austin YMCA: "Do we have any Jeremiah Meardays in Austin?" Real Community Policing Convention (ReCaps) page listing the program, sponsors and post-agenda goals of the August 1997 half-day "Real Community Policing Convention" held at Pine Avenue Church in Austin. Update on the Jeremiah Mearday police brutality case. Jul 9 Austin Voice front page story "Local Groups Rallying to sponsor "Real" Community Policing Convention. Aug 12 The Austin Voice "August 23rd is empowerment day" announces the "REAL Community Policing Convention" at Pine Avenue United Church in Austin. 1997 - Chicago Civic Media maintains the Shutdown Project Website extensive Shutdown Project materials are at this site. The Shutdown Project pioneered the concept of media-driven community policing. It was partnership of Chicago police and neighborhood community groups initiated and energized by local media (The Austin Voice) with support from citywide media (WVON radio and the Chicago Sun-Times). 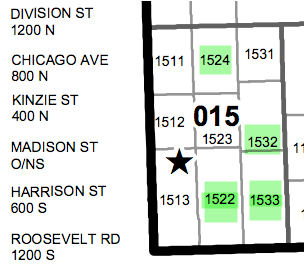 Below is the official March 31, 2000 Shutdown Project 15th District precinct map listing 66 public drug dealing areas in Austin's 15th District, with comments on the status of some areas. This map records and blends two independent counts of public drug hotspots, with one made by Austin Voice readers and the other by 15th District police led by Commander John Richardson.